Democracy, for a layman is when the people of a state or a country, choose whom do they have to be governed by. Elected Representative: Elections must be held to form a government. Majority rule: The party that achieves the maximum votes must form the Government. Recently, Karnataka, a state in India held elections for choosing it’s Chief Minister. As the tenure of the previous Chief Minister, expired. 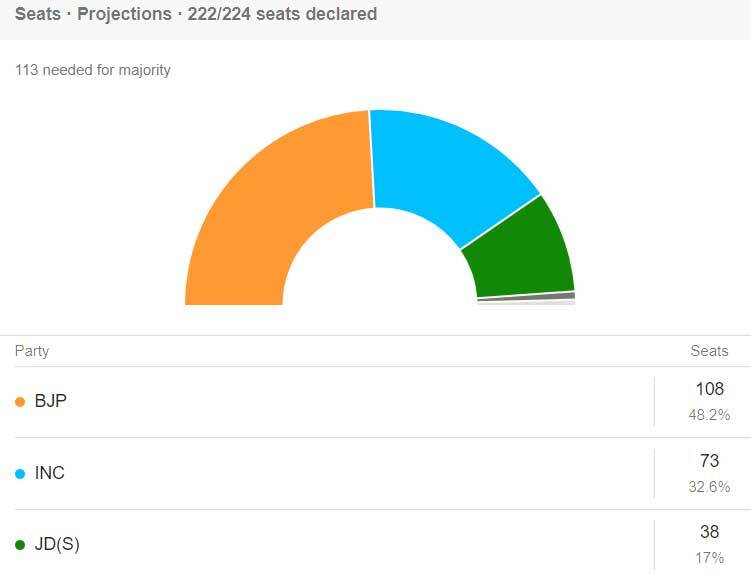 BHARTIYA JANTA PARTY got 104 seats, CONGRESS got 78 seats, JDS got 37 seats and other parties got 2 seats respectively out of 222. BJP got the maximum seats but could not secure majority. BJP and Congress have an evergreen rivalry therefore, Congress and JDS are forming an alliance to further secure a majority in the house and form the government. This is a sufficient move to defeat the goals that democracy strives to achieve. Now the question is that is this a democratic move? Democracy is people’s voice but when 2 parties combine does it actually achieve the goal of democracy? In this case, maximum people have chosen BJP to be there leader politically. Due to the combination of the other two parties, i.e., Congress and JDS the decisions and policies that are made would not be by the leaders of the chosen party, but the party that create alliance. Therefore, having elections and getting majority is of no use because in any case the minority gets to make the government. Hence, this is against democracy and merger therefore, should be held unconstitutional by the Supreme Court which is till now a valid law under the Anti- Defection Law under the tenth Schedule of the Indian Constitution. Thus, this helps the parties to achieve there personal motives. It tends to defeat the main features of democracy. Hence, defeats the goal of common good.